Bryan Reviews ‘Queens of Country’!!! It is hard to think of a comparison for the movie ‘Queens of Country’ because, quite honestly, I’ve never seen anything like it. Directors Ryan Page and Christopher Pomerenke may have just created the first of a new film genre, seamlessly weaving comedy, angst, campiness, desperation, musical numbers, and line dancing. It is rare to find a film that is so original and oddly amazing that it succeeds on all levels. 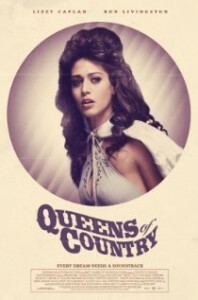 ‘Queens of Country’ breaks the rules of film and takes you on a hilarious journey of love, confusion, and music. Jolene Gillis (Lizzy Caplan), is a grown-up beauty queen from a rural town in Arizona. She spends her days putting up with her borderline abusive boyfriend, winning country western line dancing competitions, and wearing bouffant wigs to emulate Tammy Wynette, Dolly Parton, Wanda Jackson, and other queens of country. When Jolene randomly finds an ipod in the men’s restroom of a run down gas station, she discovers that the iPod is filled with the classic country songs of the women she idolizes. Convinced that the iPod belongs to her soulmate, she recruits her pre-op transexual best friend Penny McEntire (Joe Lo Truglio) and Penny’s boyfriend Cleveland (Matt Walsh) to help find the owner of the lost iPod. Their search is a bizarre and confusing journey that ultimately leads to Jolene’s own self-discovery. The writing in ‘Queens of Country’ is outstanding, and the rapid-fire dialogue rivals the quick, smart banter in ‘Gilmore Girls‘ (except here, the characters have amazingly thick southern accents). Lizzy Caplan masters her role as Jolene, allowing her audience to feel her emotional journey of sexual confusion, abuse, and competition. This might also be Ron Livingston’s best role since ‘Office Space’. In my opinion, Livingston is one of the funniest actors currently working in film. Even though he plays an abusive character in ‘Queens of Country’, I couldn’t help but laugh at his over-the-top country bumpkin dialogue, which he delivered spot-on. Finally, Joe Lo Truglio, who is known primarily for his comedic roles in ‘Role Models’, ‘Superbad’, and ‘I Love You, Man’, brought an honest and dramatic element to ‘Queens of Country’ as he struggles with his gender identity and his love of Jolene. But the greatest accomplishment of this film is how the directors juxtaposed footage of classic country music performances alongside Caplan’s scenes. The footage not only sets a tone and reflects the main character’s nostalgia, but it becomes a crucial part of the story – advancing character development and revealing Jolene’s feelings and motivations to the audience. This has been one of my favorite films at the Dallas International Film Festival, and I expect it might make my top-ten list this year. Ryan Page and Christopher Pomerenke have literally changed the game with comedy-dramas. I’d love to see if other films can follow suit. Avengers: Endgame – Film Review! This entry was posted on Thursday, April 19th, 2012 at 10:58 am	and is filed under Film, News. You can follow any responses to this entry through the RSS 2.0 feed. You can skip to the end and leave a response. Pinging is currently not allowed. « Halo 4 Will Release In November 2012 on XBOX!! !